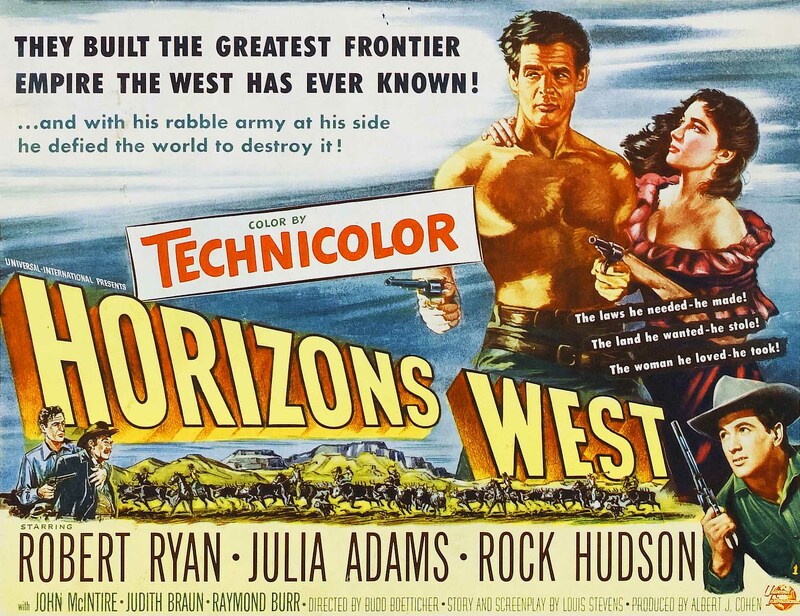 I’d have to call this Universal -International western by way of Budd Boetticher unusual. Unusual in the sense that there really isn’t an outright hero but rather two villains. Our tale in technicolor begins as a trio of “Johnny Rebs” are returning to Texas following their defeat in the war against the Northern States. James Arness and Rock Hudson can’t wait to pick up where their lives left off before the battles and work the ranch and farm the lands. 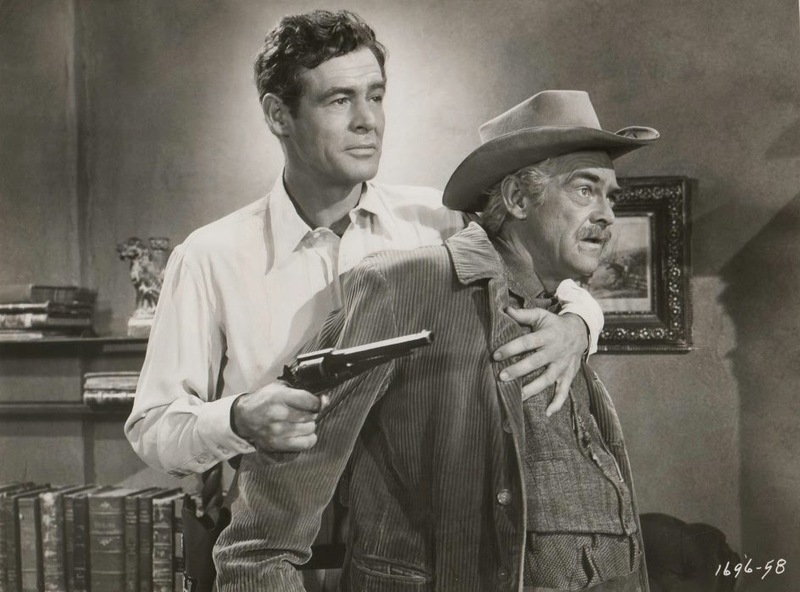 The third member and top billed Robert Ryan playing Hudson’s older brother has no intention of returning to a life of struggle and strife. He seems to be holding a grudge against the world and wants his piece of it. Ryan’s course is set when they arrive in Austin. 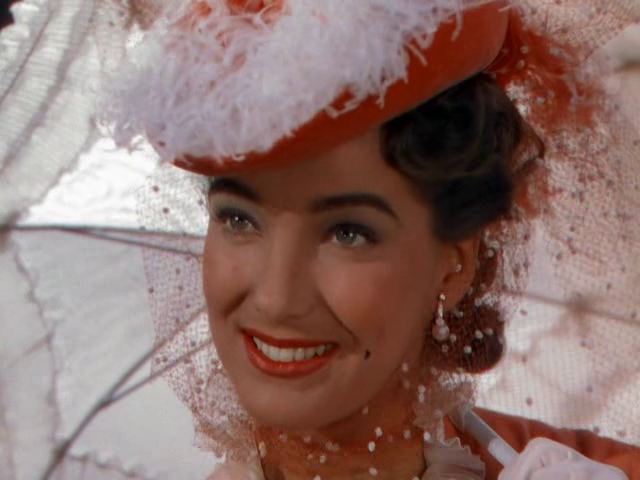 He flirts on the street with a well kept lady played by a gorgeous Julie Adams. 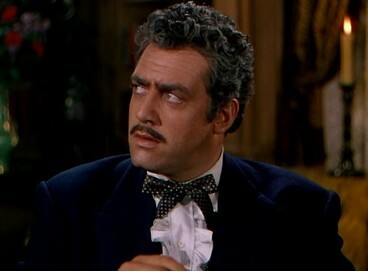 She’s the wife of a hardened land baron played by Raymond Burr. It won’t be long before the Ryan is at odds with one and in love with the other. Meanwhile back at the family ranch we welcome the delightful presence of John McIntire as the father of Rock and Robert. He and wife Frances Bavier (Aunt Bee) have been looking after Arness’ family till his return. They welcome their sons return but soon find that Robert has no desire to say put. With Ryan disgruntled and edgy he devises a plan to enlist a group of carpetbaggers to rustle cattle. His second in command is Dennis Weaver which makes this a pre Gunsmoke appearance with Arness and Weaver sharing the screen. Ryan’s main mark are the cattle carrying the brand of Burr’s outfit. Shortly thereafter Burr and his men lay a sound beating on Hudson to extract information on Ryan’s activities. This allows Julie Adams a chance to get away from Burr by telling Ryan of Hudson’s being battered and bloodied. When the dust settles, Burr is dead, Hudson saved and Ryan free to take Adams for his own wife. With our first villain dead, Ryan assumes the role against the wishes of Hudson and McIntire. Apprenticing actor Hudson goes to Ryan and tries to stop him. “That’s a man sized job.” Ryan responds. The focus of the film is clearly on Ryan and though Hudson is the far more popular name today he was third billed beneath Ryan and Adams. By putting him in this western, the studio was allowing him the opportunity to play with a seasoned veteran in both Ryan and McIntire. Considering this was from Budd Boetticher it should have played better. Budd was of course closely associated with the westerns of Randolph Scott and those oaters have aged far better than this one. 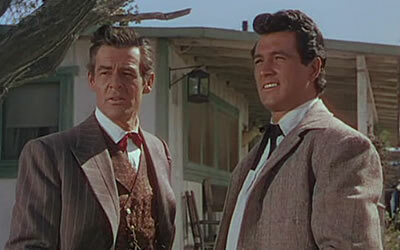 Still anytime one gets to watch Robert Ryan take the reigns heading a decent cast of actors is an opportunity to seize. 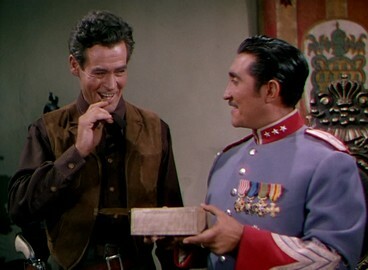 Though it’s a small scale western there is a considerable amount of familiar faces that also include Rodolfo Acosta as a would be Mexican General just across the border that struck me as a younger version of Emilio Fernandez’ Mapache from The Wild Bunch. This was a new to me western that was part of the TCM Vault collection released recently along with four other hard to find titles including Backlash and Dawn at Socorro. I’ve been liking Robert Ryan more and more. Might have to see this one! I started saying that about 10 years ago and haven’t looked back. Enjoy. A pretty good film overall, but the participation of Ryan and Boetticher raises expectations and thus it seems a little less interesting than it ought to be. It’s beautifully photographed and I couldn’t fault the cast. I also like the intentions of the script, that noir-like theme of the returning veterans struggling to readjust to life after experiencing conflict. Despite that, the structure doesn’t quite work and you end up feeling there’s a little too much story there. There’s nothing wrong with the film and the cast is above par. Just a little too off center in the end. Good point about the Noir plot point. Perhaps they should have gone that route in black in white. Blood on the Moon is a good example of western Noir that I like. Haven’t seen this one, nice combo of people involved. That;s what makes this collection from TCM Vault so cool. 4 new to me westerns. 2 down and 2 to go. I had already seen the Ladd western Saskatchewan that’s in the set.